I've driven past this elevator several times lately, and something keeps drawing me back. Tonight it was this set of stairs. So this time, I parked and got out and walked around. As I walked, I found myself in awe of the sheer size of it, and I thought of a childhood visit to Stone Mountain, GA. I remember the size of the granite mountain and the monument carved into its side. If I remember correctly, a 6-foot tall man could easily stand in one of the horses' mouths. 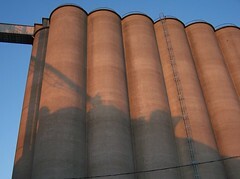 Suddenly I was thinking of all the grain stored within. I wondered how many truckloads had been delivered. How many farmers' wives come to this elevator delivering the years' wages. Then I wondered how many train cars get loaded and where it all goes. Maybe some of the Kix I had for breakfast came from this very elevator. I also wonder if ants ever feel like I felt tonight as I looked up and took photos.